At this point I must have half a dozen sable recipes scattered throughout TMH’s pages. I just can’t help myself. And, I have no intention of stopping. 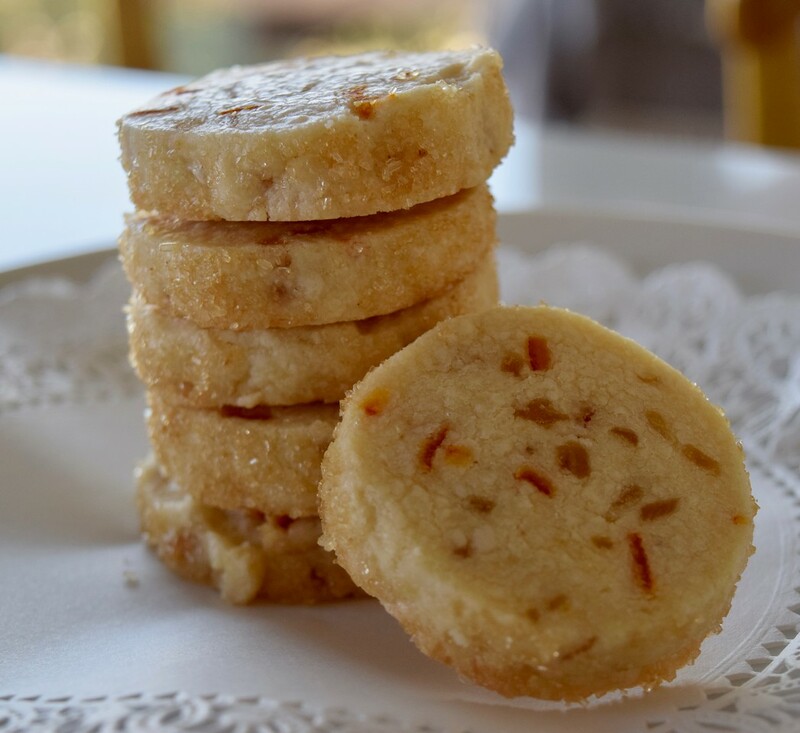 When the Wall Street Journal published their mother recipe for sables in the Off Duty section just before the holidays I was on it like an otter on an oyster. 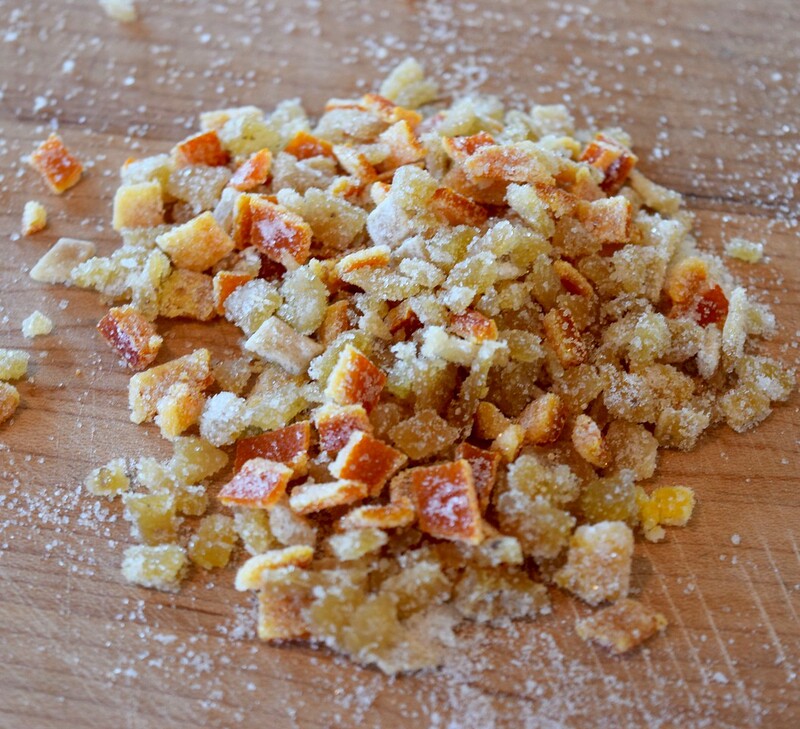 I had some leftover candied orange peel and ginger from my own holiday baking and decided to throw them in. 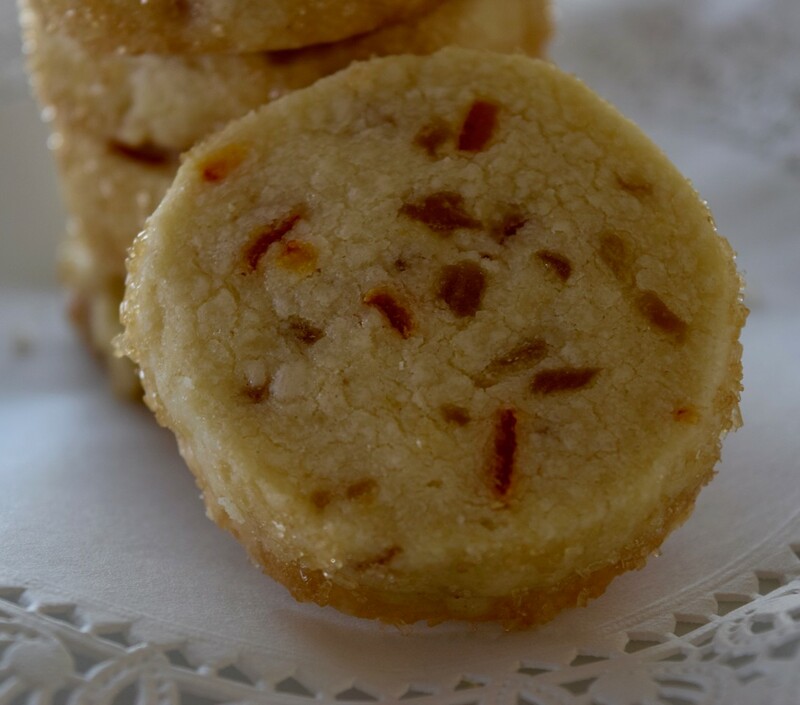 As a category, sables are a lesson in simplicity. Just four ingredients: butter, sugar, flour and salt. And this recipe my friends, is the closest I’ve come to the golden quadrangle. Slightly sweet, crumbly and while delicious plain, just asking for fun and unique combinations. Herbs: fresh mint, rosemary, thyme, lavender (as a note–start with 1 TBS chopped and go from there). If you are going to herbs, a good way to further infuse flavor is to measure out your sugar and add it and your herbs to a ziplock bag. Let “steep” for at least an hour. 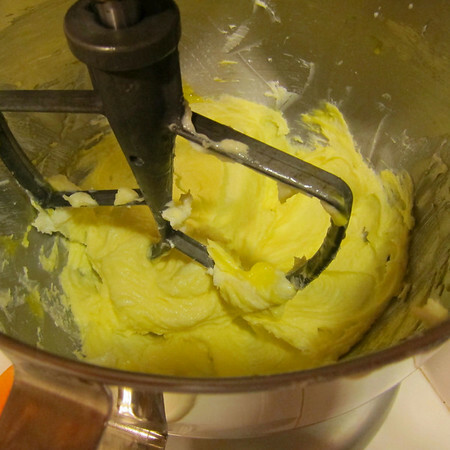 Using a stand mixer or electric hand mixer, beat the butter on medium speed until soft and whipped, 2-3 minutes. Add sugar and continue beating until well incorporated. Add salt and beat to combine. Add flour and beat until almost all flour disappears into the dough. Finish by giving the dough a few good folds with a rubber spatula. The dough will be crumbly. Divide dough in half (I use the food scale here but eye balling works). Gently coax first half into a general log shape. Set the log on to parchment paper and roll it back and forth until you have an even log about 1 1/2 inches in diameter and 8ish inches long. Set aside and repeat with other log. Sprinkle the sanding/decorating sugar onto your parchment and gently roll each log until the surface is completely coated. Roll each log individually in either plastic wrap or parchment. As a note, I first roll the log in a sheet of parchment, then place in a paper-towel roll and THEN wrap the whole thing in plastic wrap. Rolls can now be frozen for up to two months. They can also be baked from frozen but I prefer to move them to the fridge a couple of hours before I want to bake, I think they cut more nicely. When you are ready to bake, preheat oven to 325 degrees. Arrange racks in upper and lower thirds in the oven. Line baking sheets with parchment. Remove parchment/paper towel/plastic wrap from logs. Using a sharp knife, cut into 3/8 inch disks. 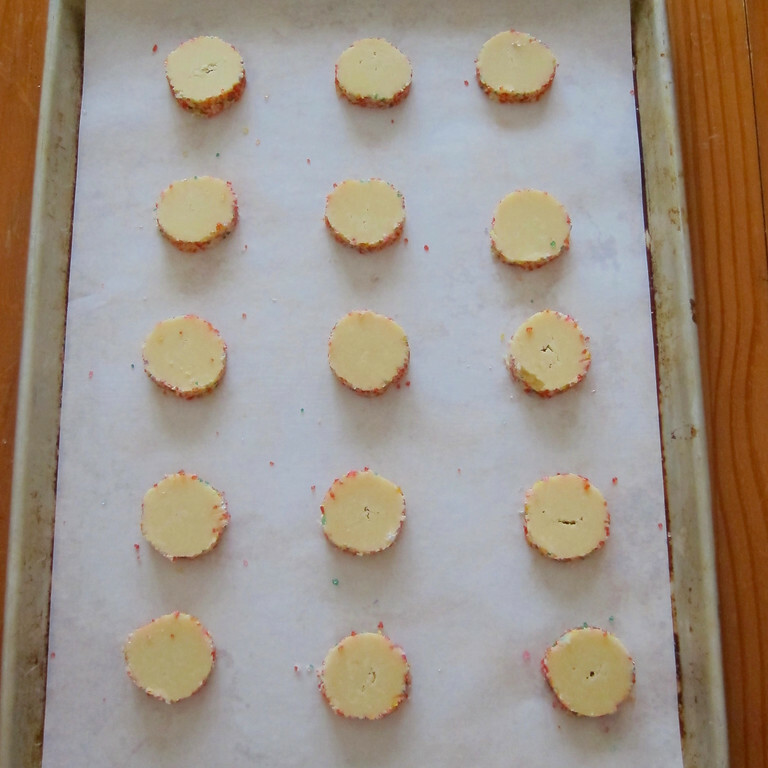 Arrange cookies on baking sheets with about an inch in-between (the sables will not spread). Bake for 18-21 minutes rotating sheets halfway through and until sables are lightly toasted. Let stand for 1-2 minutes then slide the parchment off the pan and onto a heat-proof surface. 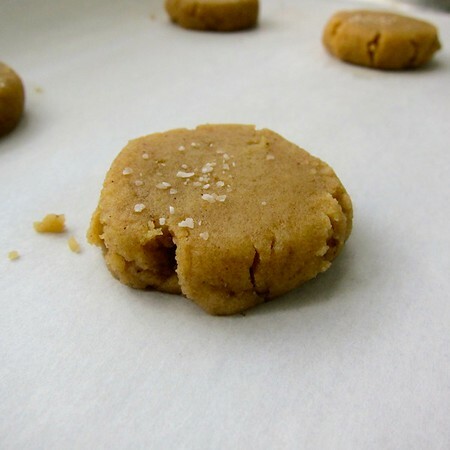 Allow cookies to cool completely before removing from parchment. A work friend of mine brought in the most ridiculous…ridiculousest? little cookies from a recent trip to Paso Robles. 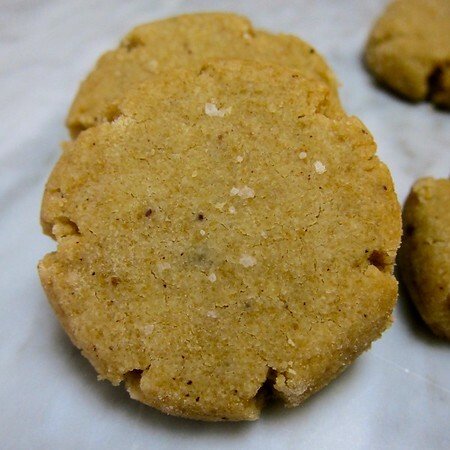 Rich and carmely with a sandy texture they came from the descriptively named Brown Butter Cookie Company. Don’t let their humble looks fool you–these are gift worthy little bites. Once upon a time this would have been a challenge. Luckily, and a little to my disappointment, the internet has made things much easier. A handful of recipes popped up on my first Google search. The fact that multiple refer to these cookies as copycats to the Brown Butter Cookie Company’s recipe is testament to how delicious they are. They’re also fun to make. There is no fancy equipment involved and the brown butter is stirred in while still hot making the dough a lot like wet sand. Once it cools down, into the oven it goes and in a few minutes you’ve got heaven. I made one single batch and then the next day got down to business with two more double batches. Spoiler alert: I found the first new recipe to add to my holiday baking for 2015. In a saucepan over medium heat, melt butter and allow it to caramelize. You know it’s getting close when it begging to smell nutty. Watch the butter closely until it turns a medium to light golden brown. Do not let it burn. In a small bowl, sift together flour and baking soda. Pour butter through a fine-mesh sieve into a medium-sized mixing bowl. Whisk-in brown butter and sugar. 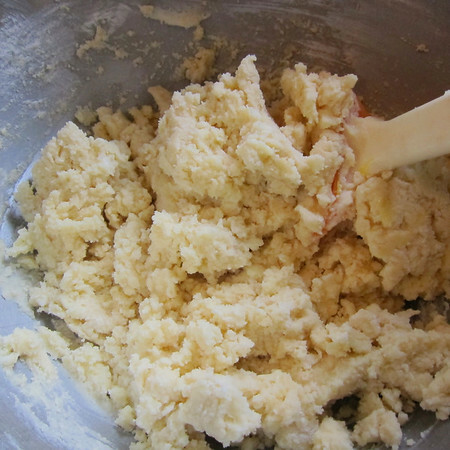 Fold-in flour mixture until just combined. Allow dough to cool to room temp. 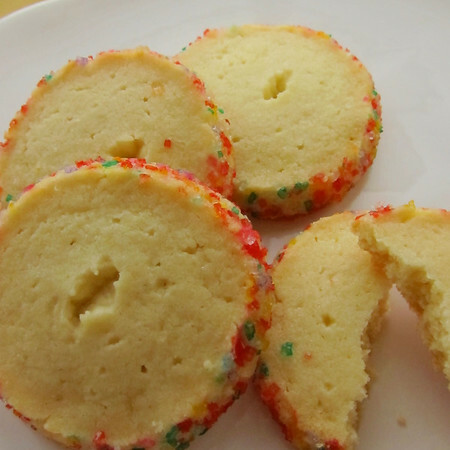 Using a small scoop (I use 1/2 ounce), scoop cookies into half-domes and place on cookie sheets about 2-inches apart. If desired, gently flatten-out dough domes using the bottom of a glass. Dough will be fragile. 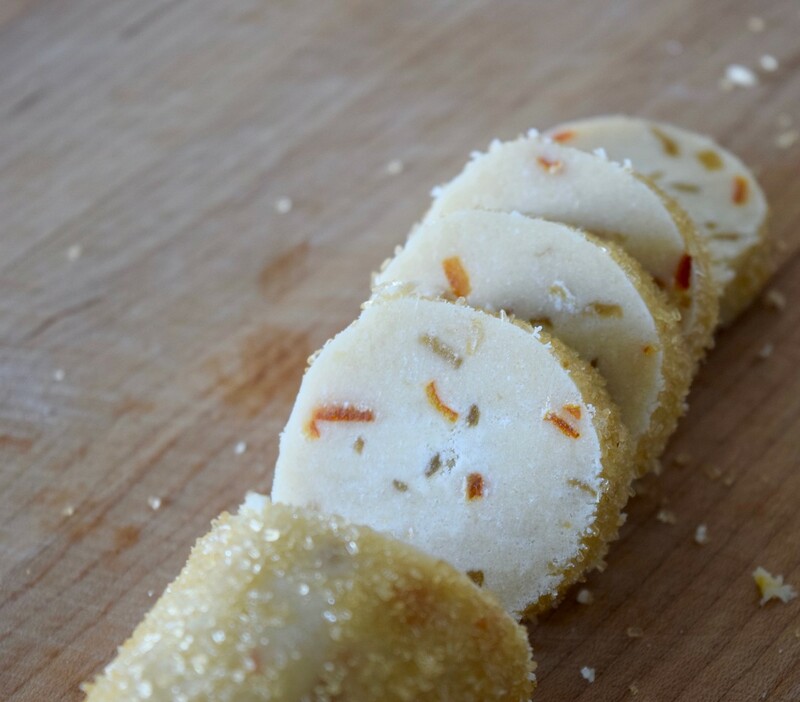 Sprinkle each with a few grains of fleur de sel. Try not to eat all of them at once. In the course of my holiday baking each year, I like to make a couple of different kinds of shortbready-sably type cookies. And each year, I like to try out something a little different. If you don’t know about TD and pink peppercorns, you can catch up here. 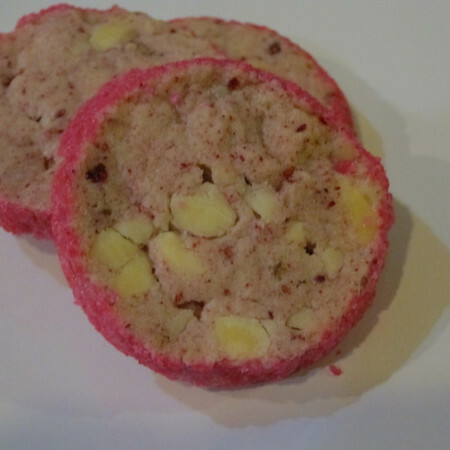 A couple of years ago I had some success with raspberry and pink peppercorn macarons so I thought it might be fun to translate that into a sable. I added in some white chocolate chunks and accessorized with bright pink sanding sugar for a little pizzazz (yes, I just said pizzazz). The results were interesting. While not for everyone, I thought they were a complex, if not festive addition. Working with a mixer fitted with a paddle attachment, beat the butter at medium speed until it is smooth and very creamy. Add the sugars and salt and continue to beat until smooth and velvety, not fluffy and airy, about 1 minute. 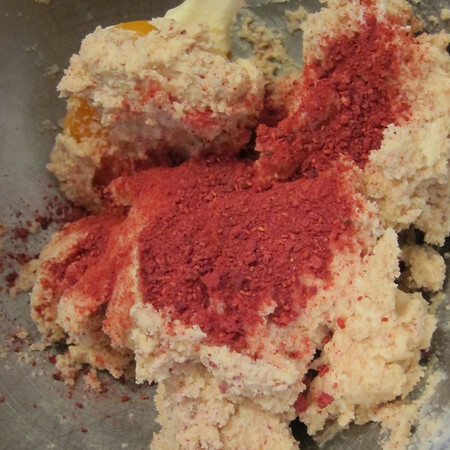 Reduce the mixer speed to low and beat in 2 egg yolks, again beating until well blended. 3. Scrape the dough onto a work surface, gather it into a ball and divide it in half. Shape each piece into a smooth log about 9 inches long (it’s easiest to work on a piece of plastic wrap and use the plastic to help form the log). Wrap the logs well and chill them for at least 2 hours. The dough may be kept in the refrigerator for up to 3 days or frozen for up to 2 months. 4. When ready to bake, center a rack in the oven and preheat the oven to 350 degrees. Line a baking sheet with a silicone baking mat or parchment paper and keep it at the ready. It has occurred to me recently that an inherent craving for the byzantine helps fuel my love of baking and cooking. Generally the more difficult a recipe, the more piqued my curiosity. I also happen to feel this way about book and television show plots. Yes, I cried like a baby when Lost ended last spring. There is certain elegance in simplicity and restraint. Think of the black Louboutin pump. A Rothco painting. A tulip. Or, in this post, a sable cookie. Sandy, crumbly, buttery and so subtly sweet that the first bite is almost surprising. 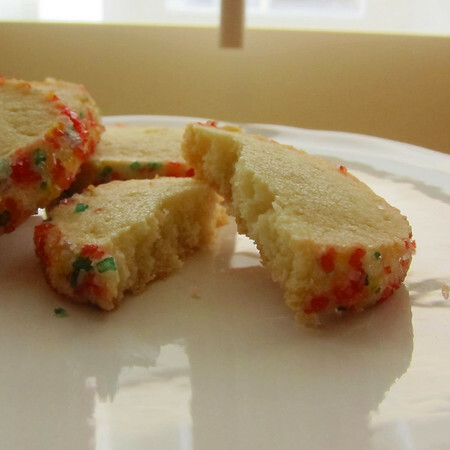 This little French sugar cookie is about as perfect as a cookie can get. When a cookie recipe only has six components, two things become paramount: ingredients and technique. You already know how I feel about ingredients in general: always buy the best you can afford (or, if the misanthrope in you is acting up–like it sometimes does with me–the best you are willing to feed other people). As for technique, thankfully, we have Dorie Greenspan. In a 2004 article in the New York Times Style Magazine, Greenspan talks about how she first learned to make sables from Parisian bread baker Lionel Poilane. In her lovely description of the lesson, she explains that he made them like he made his bread: no spoons, bowls or mixers. Over time and with the help of Pierre Herme, she refined the recipe that ultimately appeared in Baking, From My Home to Yours (2006). 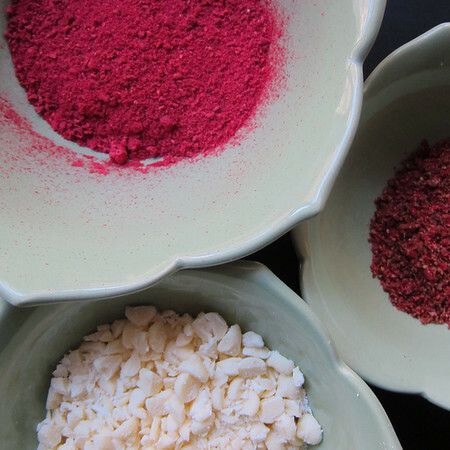 In this recipe, technique is as important as the ingredients. 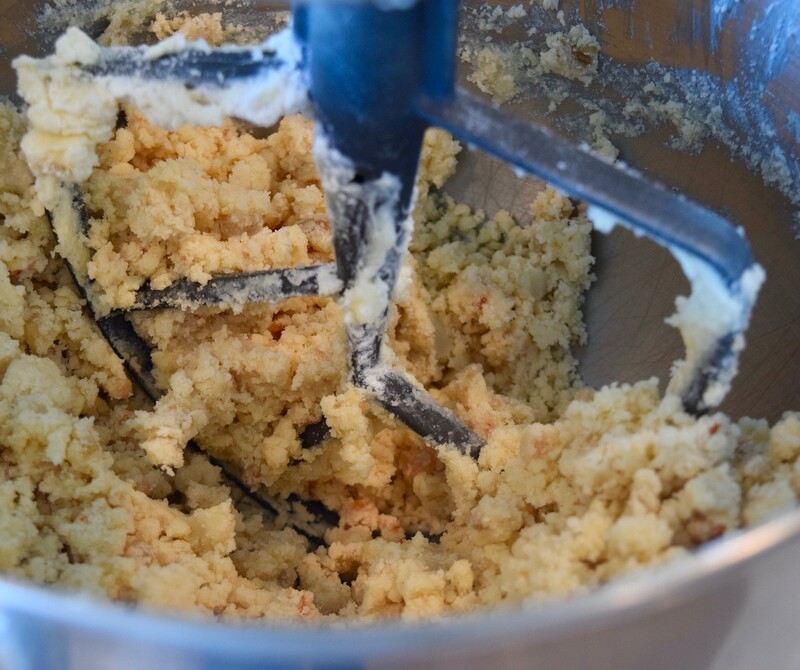 Sea salt and two types of sugar, confectioner’s and granulated, are added to softened and beaten butter until the mixture is smooth and velvety (not, fluffy as is often the case with cookies). Greenspan also notes that by “softened” she literally means, soft–not greasy and nearly liquid, as I often let my butter become. Then a couple of egg-yolks are beaten in. The presence of yolks in this recipe surprised me. I had always assumed that sables, like shortbread, don’t contain eggs. In this recipe, they help to bind together a barely-mixed dough. After this, flour, the final ingredient is added. Greenspan recommends adding the flour, covering the standing mixer with a towel and pulsing until it is just mixed-in. I prefer to start with a couple of turns of the paddle and then finish by hand. Not that I have control issues or anything. The dough doesn’t really come together as a smooth mass. You want soft curd-like (my word, not hers) crumbs. 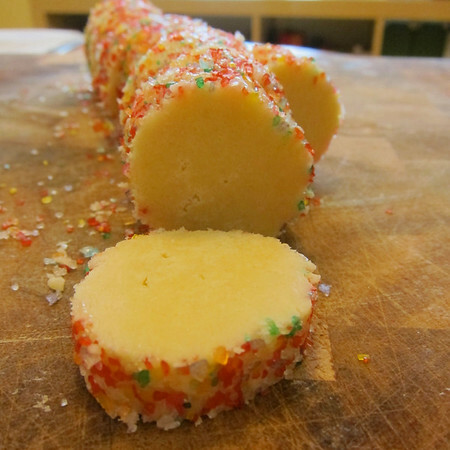 Then you divide the dough in half and carefully shape each into a log, touching the dough as little as possible. Here is where I make a slight diversion from the original recipe. In the original, you roll the logs, wrap them and chill them in the fridge overnight. Then, before baking, you give the logs a good egg-wash and sprinkle on sanding sugar. 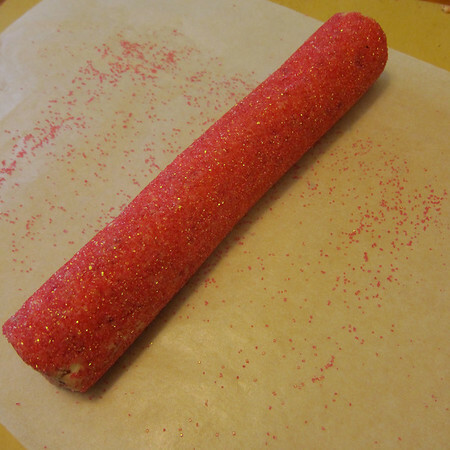 I prefer to roll the still-soft logs in sanding sugar first, then chill. Once chilled, the logs get cut into coins. Popped onto a parchment-lined baking sheet. And then, into an oven until slightly golden and crisp. 1. 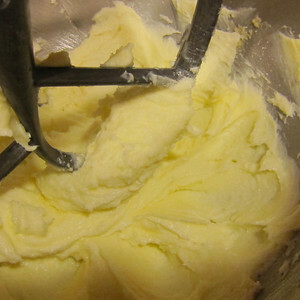 Working in a mixer fitted with a paddle attachment, beat the butter at medium speed until it is smooth and very creamy. Add the sugars and salt and continue to beat until smooth and velvety, not fluffy and airy, about 1 minute. Reduce the mixer speed to low and beat in 2 egg yolks, again beating until well blended. 5. To decorate the edges of the sables, whisk the egg yolk until smooth. 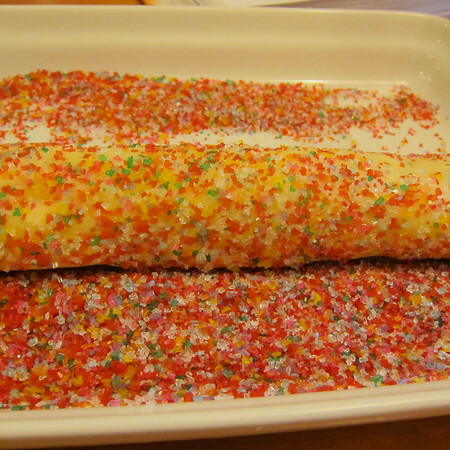 Place one log of chilled dough on a piece of waxed paper and brush it with yolk (the glue), and then sprinkle the entire surface of the log with sugar. Trim the ends of the roll if they are ragged and slice the log into 1/3-inch-thick cookies.